Razzles, first it's a candy and then it's a gum. Fate/Stay Night started as a videogame, morphed into a popular anime series, and now it's a manga as well! 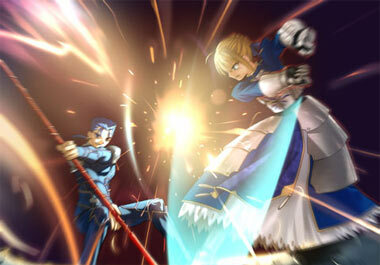 It is an adaption of the Fate/stay night visual novel, rather than the anime. 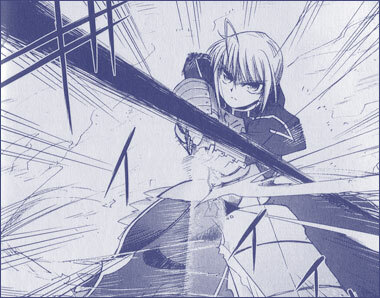 In contrast to the anime, the manga focuses solely on the "Unlimited Blade Works" scenario of the game, and has refrained from pooling story elements from the sister scenarios, Fate/hollow ataraxia or Fate/Zero. Hidden from society, there has been a deadly war going on in the small town of Fuyuki City. Seven sorcerers known as "Masters" summon a powerful familiar called "Servants" and they all fight each other till the last one. The last one is said to attain the Holy Grail which will grant them a wish. Only a few know when this war started and what the Holy Grail is, but the war was about to begin again this year. Shirou Emiya lost his parents in a fire when he was young and was later adopted by a sorcerer by the name of Kiritsugu Emiya. 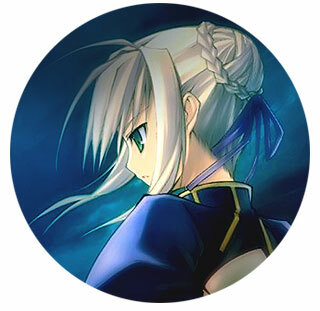 Although he was full of admiration for his adopted father and yearns to become an ally of justice, Shirou has limited powers and was unable to become a strong sorcerer like his father. 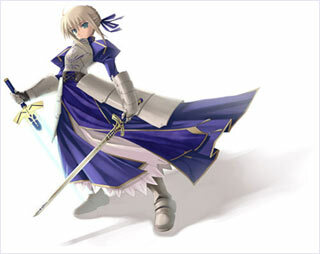 That is until one fateful day, he was drawn into the Holy Grail War and had to summon a female "Servant" known as Saber in order to protect himself. It turns out that the Holy Grail War involves a series of battles among powerful sorcerers to fight for the possession of a relic that will grant one's wishes, the Holy Grail. There are altogether seven "Masters" who can summon their respective "Servants" from different classes known as Saber, Archer, Rider, Berserker, Lancer, Caster and Assassin. These "Servants" have to hide their names in order not to reveal their weaknesses to the enemies. The Holy Grail. Its legend has driven nations to war, spilling blood across the lands and turning man against his brother man. The ultimate quest, it represents faith, spirituality and the belief in a higher power and reflects the darkest aspects of man's greed and lust for power. Long dormant, the Holy Grail War begins anew in Fate/stay night: Volume One — Advent of the Magi. Fought in the Middle Ages with sword and steel, this new War is waged with magic... a tool so powerful and so deadly that the conflict carries with it the threat of World's End. Ten years ago there was a secret war fought by master mages with their servants in order to obtain the Holy Grail and the result was devastating to everyone. Unbeknownst to the general population, a secret battle royale-to-the-death is being waged amongst seven sorcerer masters and their seven warrior servants for possession of the all-powerful artifact. No risk is too great, no sacrifice too high and no spell is too dangerous in this violent mystical war, but when orphaned teenager Shirou is fatefully drawn into the conflict, he may become the one destined to prevent the destruction that had marked the previous war. Filled with lush and vibrant animation that befits the sweeping adventure of the Grail Quest — and the apocalyptic tragedy of its resultant conflict, this crusade is a stunning adventure series populated with twists and turns, as well as a great deal of magical action. It may be the best series since Full Metal Alchemist to provide a "link" between the fantasy realm and the physical universe. 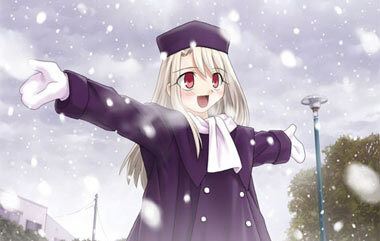 Originally released as a visual novel game (created by Type-Moon) the skyrocketing success of the series has resulted in a stunningly well-crafted anime TV series that stands head and shoulders above the average fare. 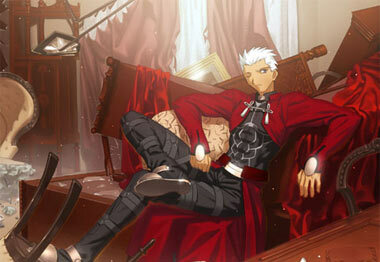 Below: Scenes from Fate/Stay Night. Below: The Japanese opening titles for Fate/Stay Night. 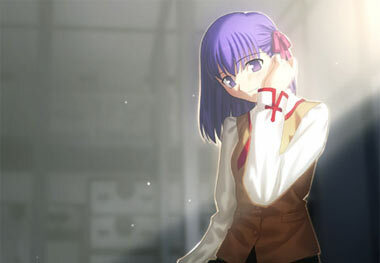 Below: Opening titles for Fate/Stay Night PC games. 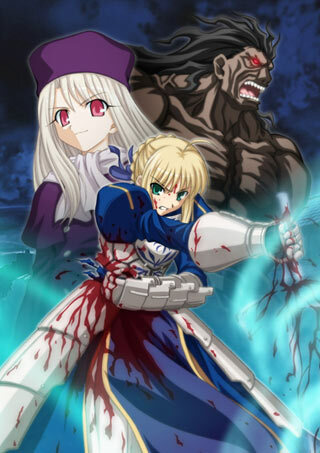 Below: Promotional artwork for Fate/Stay Night.